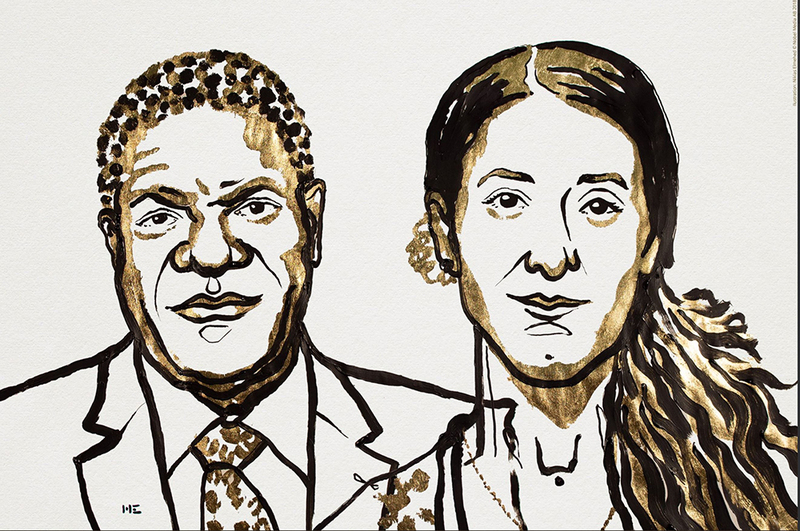 Erbil – The UN Migration Agency, IOM, congratulates the 2018 Nobel Peace Laureates Dr. Denis Mukwege, a Congolese doctor and advocate, and Nadia Murad, a prominent Yazidi human rights activist, for their efforts to end the scourge of sexual violence as a weapon of war and armed conflict. For Ms. Murad, the prize comes more than three years after she escaped her ISIL captors in Iraq and resettled to Germany as part of the Humanitarian Admission Programme, jointly implemented by the German State of Baden-Württemberg and IOM Iraq, in close partnership with the Kurdistan Regional Government in Iraq. During the summer of 2014, thousands of Yazidi women in northern Iraq were subject to conflict-related sexual violence after being abducted while their hometowns were overtaken by ISIL. Many saw members of their families, relatives and friends brutally murdered. The abuse sexual violence survivors have suffered is impossible to measure, but the strength of survivors and advocates like Ms. Murad and Dr. Mukwege has created tremendous impact, recognized by the Nobel Committee. “Awarding Nadia Murad with this prestigious prize is of crucial importance to keep the focus of the international community on the fight against gender-based violence in conflicts, which often go hand in hand,” said Gerard Waite, IOM Chief of Mission in Iraq. Through the programme, more than 1,000 survivors of ISIL violence, mainly from the Yazidi community of northern Iraq, were resettled to Germany and enabled to rebuild their lives after their terrible experiences. IOM supported this programme with comprehensive pre-departure assistance, including psychosocial counseling, cultural orientation, education, medical care, transportation and accompaniment to Germany. “Baden-Württemberg greatly appreciated the partnership with IOM on the Humanitarian Admission Programme and is grateful for the close collaboration with the Government of Iraq, the Kurdistan Regional Government as well as local civil society organizations in Dohuk, in the northwestern part of the country, which continues to host many internally displaced persons,” said Michael Blume, Head of the Special Quota Project from the German State of Baden Württemberg. After settling in Germany, Ms. Murad began her campaign to end sexual violence not only in Iraq, but around the world, by raising awareness about ISIL’s brutality, recounting her own story and demanding recognition and justice for her fellow survivors. As an organization working on transitional justice and reparations for victims of conflict related sexual violence in Colombia, Sierra Leone, Nepal, Bosnia and Herzegovina and other locations, IOM is very appreciative of Ms. Murad’s efforts to advocate for and defend the rights of the survivors across the world. In her role as UN Office on Drugs and Crime Goodwill Ambassador for the Dignity of Survivors of Human Trafficking, Ms Murad and her fellow activists, advocated on behalf of the Yazidi community, resulting in the unanimous adoption of United Nations Resolution 2379 (2017) and the establishment of a UN investigation into ISIL crimes. IOM Iraq continues to work closely with local partners to support victims of trafficking and survivors of conflict-related sexual violence with psychosocial support, specialized mental health care and access to livelihood opportunities both in and outside of camps for the internally displaced. However, the needs are great for the 1.89 million Iraqis still displaced, including access to employment, food and shelter. IOM provides these essential services, remedies and reparations for survivors of conflict-related sexual violence, in partnership with affected communities, civil society partners, the Government of Iraq, the Kurdistan Regional Government and international partners. The Nobel Peace Prize is awarded annually to laureates who promote peace and restore justice in their work. Occasionally the prize can be shared between multiple recipients who have been deemed exceptional. Dr. Mukwege, a co-recipient of the award this year established the Panzi Hospital in his native eastern Democratic Republic of Congo which provides specialized assistance to sexual violence survivors.